We have Shipped Christmas Trees to customers in over 40 States, including Anheuser Busch in Tampa, Florida and Signet Jewelers in Dallas, Texas! 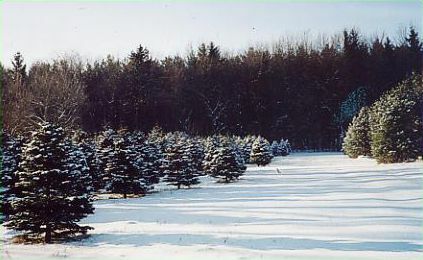 Welcome to ChristmasTreesNow.com, your source for fresh cut, direct mail order Christmas Trees. Shrink Wrapped... Our fresh cut Christmas trees are shrink wrapped to ensure freshness prior to shipment by FedEx. Environmentally Friendly... We use no pesticides or herbicides. Our Christmas are organically grown in grassy fields that are periodically mowed. We plant two seedlings for every tree harvested. Recyclable... Real Christmas Trees are organic and recyclable unlike artificial trees which are typically made of plastic and may even contain some lead. Artificial trees do not decompose but contribute to our growing landfill problem. Connection... When you purchase one of our trees you build a connection with us, the growers, and the soil it is grown in. Our Mission... We practice sustainable agriculture and grow natural products. You get everything you want in a fresh Christmas tree or Christmas wreath - moist, fragrant needles, attractive shape and minimal needle drop - all at a great price without the hassle of buying from the local tree lot. "These Christmas Trees have Frequent Flyer Miles"